Faintly impressed 'Made in England' on the underside of the front left paw. I am happy to send almost anywhere in the world. If your country isn't covered by the GSP (eg. ). HAREFUR / OLIVE GLAZE EFFECTS WITH FINE ALL ROUND INCISED LINE DECORATION. incised d TO BASE. highly unusual piece of studio pottery design. GREAT STUDIO POTTERY. “ SWAN SHIRLEY 1957”. Super deep orange drip glaze. Certainly will need further research, fantastic piece of studio pottery. There are stress lines from when the pot was fired these run horizontally along the lines the clay was coiled when being made. 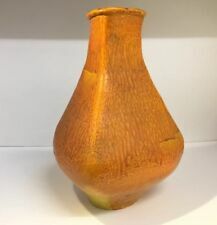 A superb Katherine Pleydell-Bouverie studio pottery stoneware vase. Wheel thrown, on a slightly flared base with pronounced throwing marks and s slightly everted lip. Carved 'lotus leaf' decoration with olive green ash glaze and blue tints below the rim and where the glaze pools to the foot. INCISED LINE DECORATION WITH VARious HUES OF CREAM BLUE & BROWN GLAZE DECORATION. FINELY POTTED STUDIO POTTERY JUG. GREAT STUDIO POTTERY. UNMARKED TO BASE. The rounded bowl is slightly 'squeezed' in shape and stands on a narrow rounded unglazed foot rim with a recessed base with impressed seal marks for Lucie Rie and Hans Coper. We understand that purchasing a pre-owned handbag online can be daunting. OXSHOTT STUDIO POTTERY THREE LEGGED BOWL. OXSHOTT IN SCRIPT to BASE. great item. GREAT SHAPE. Very impressive studio pottery vase. Made in France. Has a chip at rim (not on top of rim). can be seen on pictures 2 and 4 and hardly noticeable cos of raised pattern. 15.5 cms high. TAENA STUDIO POTTERY SLIPWARE HANDLED BOWL. TAENA SEAL IMPRESSED TO BASE. GREAT STUDIO POTTERY. VERY SUBTLE BLUE GLAZE. ENGLISH STUDIO POTTERY DESIGN, BALLERINA DESIGN DISH. 21CM LENGTH, HEIGHT 2CM. RK ETCHED TO BASE. Ceramic Cornish Fisherman. Has attached an original label. We hope they satisfy you as to the detail and condition of the item for sale. Makers mark stamped on one foot. 4.5" (120 mm) tall. Our Ref: 21518. Very nice earthenware mosaic vase signed Gerbino Vallauris from the 40’s-early 50's. The condition is good with a small firing flaw, as seen on the pic 1, and a small crack at the bottom, which is not unusual on these mosaic potteries. Signed on the bottom simply Judd 56. Overall the vase looks impressive. Approx size :- 26cm tall x 18cm wide. Unusual Elaine Goddard Ltd pottery shallow pale blue boat form mid century planter - ideal for cactus. in very good used condition with age related crazing - see photos. Henry Hammond (1914-1986). a stoneware plate c.1950, impressed seal to foot edge with trailed river design to the centre. about 22 cm wide. HAND MADE STUDIO POTTERY LAMP BAS. 8 1/2" X 5 1/2" - HOLLOW. UNKNOWN MAKER. LOVELY OLD COLOURFUL SLIPWARE PLATE. GREAT STUDIO POTTERY. WOODS & SONS BURSLEM ENGLAND Two Round Hand painted vases " Indian tree "
H J WOODS BURSLEM ENGLAND. " Indian tree ". An identical pair of Royal Norfolk Pottery fruit bowls, late 1950's. Decorated with slip applied cross and dots. Artist initials for William Fishley Holland on the base. Decorated with a Swan and inscribed 'Chedder'. Artist initials for George Tonkin Holland on the base. This is an early Tintagel Pottery mug dating from the 1950’s and featuring the dragon design. The jug measures 12 cm h at the lowest point as the base is slanted, the base width is 8cm. The jug is in good condition with no chips or cracks, and it has the painted Tintagel Cornwall. I have other Tintagel listed do take a look. Thanks for looking and do check out my other items. In Mink & Cream Marbelled Effect. Mink & Cream veined stripe following vase shape contour. Technique is to form a vase from a single clay sheet. Open edges are left unsmoothed to add to the vase intrigue. Dicker Pottery. We hope they satisfy you as to the detail and condition of the item for sale. 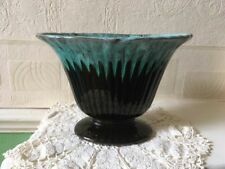 IN EXCELLENT CONDITION-HAND POTTED ON THE WHEEL A 12”(30.5Cm) TALL STUDIO POTTERY POT/UWER -SIGNED AND DATED ON THE BASE : D.SMITH 1949- AND BEAUTIFULLY GLAZED-HEAVILY IN ‘RAILWAY’ GREEN-SEE PHOTOGRAPHS. Eric Leaper Studio Pottery Newlyn - Orange Fat Lava Dish Very good condition. No chips, cracks or restoration. Measures 21.5cm x 10.5cm. Will be extremely well packaged and promptly despatched. 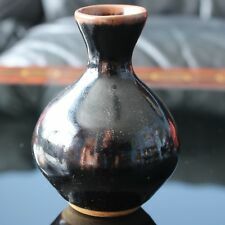 Deep chocolatey brown Gibsons flared jug from the 1940s. The photos do not do this piece justice, the first picture shows the colour of the jug, and picture with the ruler shows the flare in the jug. (1) one set is in excellent condition. ( Buy one get one free). A very beautiful piece of English slipware. An exquisite little jug, hand-thrown from earthenware and covered in multiple bands of trailed slip, which has then been 'combed' to lovely effect. The loop-shaped handle similarly with dark spotting. IMPRESSED POTTERY MARK ON THE BASE CIRCULAR FORM ( DICKER WARE MADE IN ENGLAND . HAND MADE VASE WITH LIGHT BROWN AND GREEN SPIRAL GLAZE . ). A beautiful lidded pot made and designed by David Leach in his iconic style. The pot itself is made from a Stoneware type material. The lid is glazed and decorated with a stylised brown pattern and the pot is grey with a speckled glaze. Husband & wife team Jean & Jacqueline Lerat. (Now deceased). Initially set up a studio in La Borne France in 1943 revitalising the area’s wood fired ceramics tradition and producing functional pieces. The pattern shows sun, blue sky, turquoise sea, fishing boats, seagulls, a fisherman with a net and a fishwife with fish. Beehive top with saucer dish base. Made in England – blue stamp on base of saucer. On offer is a charming Pedestal Egg Cup made by William Fishley Holland at Clevedon Pottery, Somerset, England, in the mid-1950s. The egg cup is decorated with a pale green glaze, made using local red earthenware clay. NOTE Please excuse any white marks these are from the cameras flash. It is 4.5cm in diameter by 6.5cm deep and is in fair condition having a hairline near the rim and a couple of very small chips to the rim, would suit a first-time buyer or restorer. On the underside is the William Fishley Holland mark. The unpacked weight is 67 grams. Very pale blue grey colour with blue flower banding. Turquoise & White Lava Effect. Impressive lava effect vase. "Lava flow" effect is raised and very tactile. Urn double handled shape vase. No studio mark. EXCELLENT / VERY GOOD CONDITION. 16.5cm tall.